Ald. 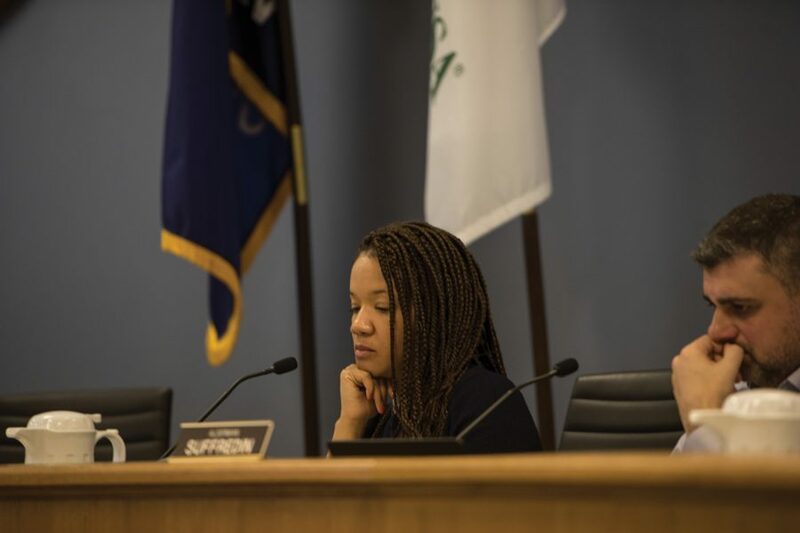 Robin Rue Simmons (5th) thinks at a City Council meeting. Aldermen adopted a new sexual harassment policy to comply with a new state law at the meeting Monday. One week before the state deadline, Evanston aldermen voted unanimously in favor of adopting a new city sexual harassment policy in accordance with recent changes to Illinois law. The resolution follows state legislation passed in November, mandating that all governmental units enact new sexual harassment policies by Jan. 15. The act requires policies to include four main components: a prohibition of sexual harassment, details on procedures for reporting harassment, protection against retaliation towards harassment reporters and consequences for both violating prohibition and knowingly making a false report. The resolution adheres to the Illinois Human Rights Act’s definition of sexual harassment and utilizes the Illinois Whistleblower Act to protect employees reporting violations of regulations from employer retaliation. It is a distinct change from Evanston’s previous policy, which human resources division manager Jennifer Lin said was much less extensive. Lin said the new policy’s main changes include adding examples of different kinds of sexual harassment — such as verbal, nonverbal, sexting and texting — and adding details on various ways to report harassment. Ald. Robin Rue Simmons (5th) told The Daily that the current national climate, with harassment infiltrating government, entertainment and business, has raised awareness about the importance of such policies. The policy outlined in the resolution is also being adopted by a number of nearby municipalities, Evanston deputy city attorney Michelle Masoncup told The Daily. Aldermen passed the resolution quickly and without much discussion. Deputy city manager Erika Storlie told The Daily that Evanston will conduct training in the spring to comprehensively review the policy. Organizing a city-wide staff training, which typically happens every other year, is logistically difficult due to the varying schedules of employees, but Storlie said this policy merits the event. A previous version of this story misstated Ald. Robin Rue Simmons’ ward in the story’s caption. She is the alderman of the fifth ward. The Daily regrets the error.